Unfortunately in our industry there is a lot of dishonesty. I've received several emails since starting this blog from people around the country (and Canada) telling me their nightmare countertop stories. Just the other day I measured a job that we are fixing for another fabricator who did horrendous work and now he won't even finish the job or call the customer back. We at MGS by Design try to have integrity in our work. We will always tell you the truth....even when it's not what you want to hear and even when it's not easy for us to tell you the truth. There are few things in life that I find more important than honesty. That being said, B.J. came across this wonderful article recently and asked me to post it here. Above photo from Light Planet. “Of all the kinds and colors of marble, the milky white Carrara is the rarest and most costly. Sculptors who lived during the Golden Age of Tuscan Sculpture claimed that it was the purest substance God ever created, and they longed for the feel of it beneath their hands. Any sculptor who was commissioned by a wealthy patron of the arts to create a statue of Carrara marble felt himself to be highly favored. 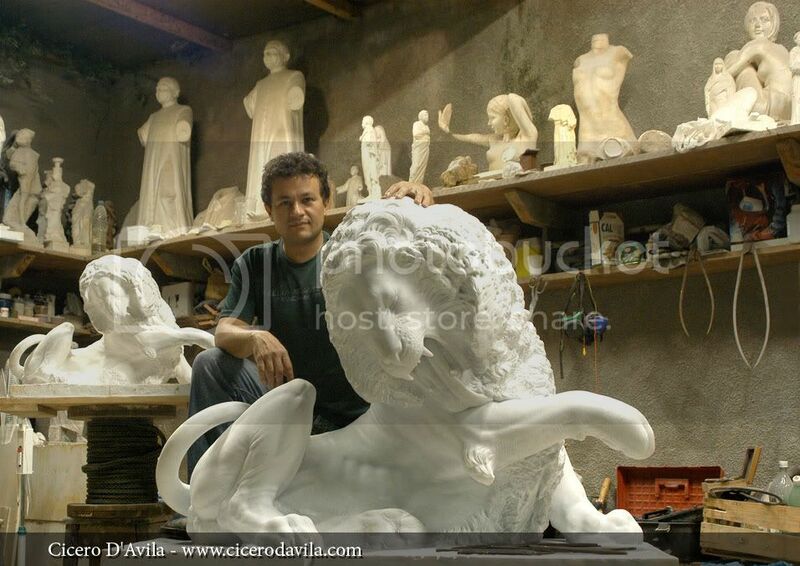 “Sculpting in marble was neither fast nor easy. In addition to innate talent, it required both careful analysis and tedious, backbreaking work. The artist would have to study the block of marble to determine its essential nature. He would then need to discover the direction of the grain and ascertain the presence of any flaws. He had to make careful and precise plans and drawings which were in accord with the structure of the marble itself. Then, with consummate care, he would begin to chip off the superfluous marble, layer by layer, until he revealed the form he had envisioned. “Any mistake could be disastrous. If the sculptor went against the grain he could crack the marble; if he struck a blow with too much force he could mash the crystals beneath the surface, creating holes and ruining the sculpture. This seldom happened with the greatest of sculptors, who labored with infinite care and supreme sensitivity. Those with lesser talent and little patience, however, would occasionally be confronted with such a disaster. Rather than admit their blunder and lose their commission, some would resort to subterfuge. “Eventually these two words merged to become a single word, ‘sincere,’ meaning ‘pure, unadulterated, whole, intact, uninjured.’ When the word was used to refer to marble works of art, the emphasis was on the fundamental wholeness of the statue, not just on its superficial or outward appearance. Above photo from Cicero Davila. Above photo from Stone Sculptors. What an interesting story! Thanks for sharing it. Those boxing gloves are awesome! There is something more to this sculptor. in the model process the sculptors mind was changed. In a cathedral in Copenhagen, Denmark there is a magnificent statue of Jesus by the noted sculptor Bertel Thorvaldsen. When Thorvaldsen first completed the sculpture he gazed upon the finished product with great satisfaction. It was a sculpture of Christ with face looking upward and arms extended upward. It was a statue of a majestic, conquering Christ. Later that night, however, after the sculptor had left his fine new work in clay to dry and harden, something unexpected occurred. Sea mist seeped into the studio in the night. The clay did not harden as quickly as anticipated. The upraised arms and head of the sculpture began to drop. The majestic Christ with arms lifted up and head thrown back was transformed into a Christ with head bent forward and arms stretched downward as if in a pose of gentle invitation. At first Thorvaldsen was bitterly disappointed. As he studied the transformed sculpture, however, he came to see a dimension of Christ that had not been real to him before. It was the Christ who is a gently, merciful Savior. Thorvaldsen inscribed on the base of the completed statue, "Come Unto Me," and that picture of the Lamb of God in his mercy has inspired millions. Thanks for the additional information Tim. That is really interesting.